The prospect of providing internet for all is of great interest to more than a few companies. Facebook reportedly just terminated its formerly undisclosed $1 billion project to position a satellite for low cost internet access for developing countries. 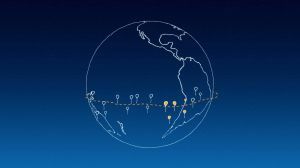 Google has a high-altitude balloon project to bring internet to underserved areas, called Project Loon. Their pilot, started in 2013 in New Zealand, has expanded to a relatively wider area and the current goal is to establish a global ring in the Southern Hemisphere. Another company, called O3b and started by Greg Wyler in 2007, currently has 12 satellites up and sells internet service within 45 degrees of latitude north and south of the equator. It is now the largest internet provider in the Pacific, appealing to needs of tropical islands, ships and oil rigs. Wyler’s new endeavor, OneWeb, seeks to spread internet coverage and will use 648 low orbit satellites to be launched in 2018. SpaceX, Elon Musk’s ambitious and successful space company, has its own low orbit vision with many more satellites that is poised to provide further reaching coverage. SpaceX has reportedly filed with the Federal Communications Commission for clearance to test its global-internet-by-satellites technology. The plan would use the company’s famed Falcon 9 aircraft to position 4,000 satellites into a concerted low-Earth orbit to deliver high speed internet access to the entire world. This low orbit is at approximately 750 miles up as opposed to the typical geosynchronous (completes a single orbit in 24 hours) satellites at 22,000 miles. That is expected to eliminate the lag standard to traditional, higher satellites. SpaceX or OneWeb (likely both) are projected to achieve tangible success in a low-orbit satellite network providing internet service to more and more users. OneWeb’s (and Ob3’s) place is as a wholesale provider, selling satellite coverage and equipment to telecommunication companies. The “telcos” then are the ultimate arbiters of the price people have to pay and who can be covered. This is an arguable hindrance on the promise of truly universal internet access. In contrast, SpaceX’s ambitions look to revolutionize global telecommunications. Musk has stated “Our focus is on creating a global communications system that would be larger than anything that has been talked about to date.” If approved, the SpaceX tests are projected to begin as early as next year and the operation could be functional in as soon as five years. With this “new space race” the drive to broaden access to the internet and advance communication technology is unmistakable and the vision of universal internet access is closer than it has ever been before.